This comprehensive course offers important information on the diagnosis and treatment of golf injuries. Dr. Blanchard has combined his unique practitioner expertise (30 years in private practice) with his actual play experience as a competitive golf professional (career low round of 62) to offer students a more complete understanding of taking care of patients who play golf. The course includes excerpts from Dr. Blanchard’s textbook, The Physician’s Golf Injury Desk Reference and has been designed to help students link swing mechanics to injuries in an effort to help identify if a patient is at risk of injury before they even hit a golf ball. The Anatomy of a Golf Injury: There area reported 20 million golf injuries every year! Learn the mechanism behind the most common golf injuries and learn how you can educate your patients to play injury-free. New Patient Examination: There are 14 areas of the body that require golf-specific conditioning. You will need to know the areas, know how each area relates to the golf swing, know how to examine the area and know how to treatment protocols should you patient fail any part of the examination. Golf Posture: To avoid injury, golf requires specific balance and stability that is directly related to the patient’s posture. You will learn how to identify postural instability and the treatment/ correction protocols for posture that is golf-specific. Swing Analysis: Most patients who become injured playing golf have put themselves at risk of injury based on how they repeatedly swing the club around their body. They are out of position. You will learn to identify the correct positions and if your patient’s are at risk of injury before they ever hit the ball. The Basic Training course includes over 150 photos and illustrations, 15 different QuickTime Movies and audio voice-overs from the author. This course includes 2 examinations. A passing score of 85% or better is required before you would be eligible to take the Inermediate Training course. Your Basic Training will take approximately 6-hours to complete. This course might be eligible for State Board approved CEU’s, please contact your State Association for details. This comprehensive course offers important information on the management, fitness and conditioning protocols of “well” patients seeking improved performance on the golf course. Dr. Blanchard has combined his unique practitioner expertise (30 years in private practice) with his actual play experience as a competitive golf professional (career low round of 62) to offer students a more complete understanding of taking care of patients who play golf. The course includes excerpts from Dr. Blanchard’s textbook, The Physician’s Golf Injury Desk Reference and has been designed to help students eventually position themselves as the “Golf Doctor” in their community. Barriers to Performance: There are 4 categories of performance barriers. You will be taught how to help your patient’s identify their barriers. You will learn the treatment and training protocols that will give your patients the opportunity to take their game to the next level. Strength and Power: Everyone who plays golf would like to hit the ball further. To hit the ball further requires your patients to generate more club head speed. You will learn Dr. Blanchard’s 7-point plan for generating more club head speed to hit longer more powerful golf shots. Environ-Mental Issues: There are environ-mental barriers (your patients might be allergic to the pesticides/flora and fauna on any given golf course) that will restrict motor movement. There are emotional barriers (stress will restrict the smooth motor movement needed to execute a good golf swing). Learn to work with your patients who love golf to identify, and treat environ-mental issues. Case Studies: Intermediate Training includes numerous case studies designed to challenge your growing expertise using everything you have learned from the combined courses. The material is presented in a concise and clear manner with over 100 photos, illustrations, numerous Quick Time Movies as visual aids and audio voice-overs from the author. A passing score of 85% or better is required before you would be eligible to take the Intermediate Training course. Your Intermediate Training will take approximately 6-hours to complete. This course might be eligible for State Board approved CEU’s, please contact your State Association for details. To become Golf Injury Certified you will need to complete the Advanced Training seminar and pass the written Certification Examination. 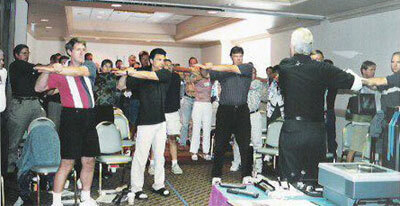 The content for the Advanced Training seminar was taped from a live, 3-Day Advanced Training seminar. I have selected 8-hours of video for you to watch and a seminar workbook has been provided for you to take notes as you follow along. The Advanced Training seminar has been designed for the doctor who wants to establish and grow a referral relationship with the PGA instructors in their community. The PGA instructors are working with hundreds of golf students who are not physically fit or conditioned to play golf. It is difficult for instructors to teach golf to students who present for lessons with postural instability, structural weakness and poor flexibility. Before long, students become frustrated and perhaps injured. The Golf Injury Certification Program is designed for you to be able to cross-train your medical expertise with PGA instructors. In addition, you will learn how to market your expertise as a Golf Injury Specialist. You will learn how to set up and co-teach preventative workshops on golf fitness and conditioning with the PGA instructors in your community. The Advanced Training seminar has been divided into 4 parts. Note - some of the chapters are a "live-seminar" review of course work previously covered in Basic and Intermediate Training. You might find that the live presentation, using student case studies, will expand your understanding of the material. Are You Positioned in the Marketplace? Swing Analysis: Are You in the Right Position? The live seminar has been designed for the doctor to workshop all the information learned from the on-line training. The weekend will be divided into 3 modules: 1) Patient examination and treatment protocols using live students with real, everyday golf related problems. 2) Instruction in the latest extremity adjusting / taping techniques for golfers of all levels of ability. 3) Marketing strategies designed for you to be able to cross-train your medical expertise with PGA instructors. In addition, you will learn how you can set up and co-tech preventative workshops on golf fitness and conditioning with the PGA instructors in your community. "I've been teaching golf for more than 20 years. I can honestly say that lack of proper golf-specific fitness and conditioning has been responsible of over 50% of every poor golf swing." Patient exam including swing analysis. Each student is videotaped at the driving range. This workshop will train you to identify and correct all flexibility and postural deficits as well as each of the three phases of swing analysis key points 1, 2 and 3. You will participate in a short game workshop and learn training techniques for putting, chipping and sand traps. Extremity adjusting / taping protocols for golf related injuries. The 9-Hole Playing Lesson. 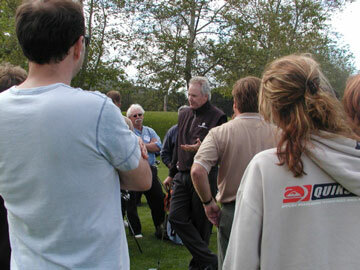 We will get out onto the golf course to play and learn the training for golf protocols developed by Dr. Blanchard. Learn how to apply the 3 Key Points of swing mechanics under playing conditions. Learn to communicate your expertise with your patients and how to generate new patient referrals from the PGA instructors in your community. Certification Examination. $295 (If you have completed the on-line Basic, Intermediate and Advanced Training one week prior to the start of the 3-day seminar. The first of its kind! 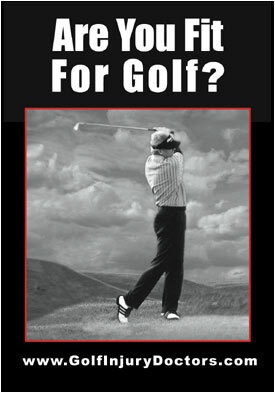 An essential new book for all healthcare providers treating golfers, this comprehensive text offers important information on the diagnosis and treatment of golf injuries. Dr. Blanchard combines his unique practitioner expertise with his actual play experience as a competitive golf professional to offer readers a more complete understanding of taking care of patients who love to play golf. 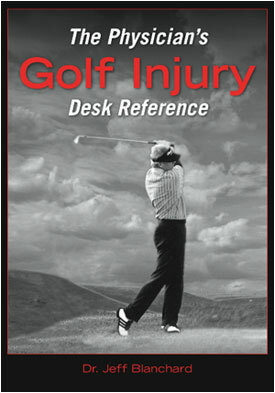 The Physician's Golf Injury Desk Reference is designed to help providers link swing mechanics to injuries to help identify the root cause of an injury and to help identify if patients are at risk of injury before they even hit a golf ball. Material is presented in a concise and clear manner, with visual aide, objective chapter openers and summaries on what the reader should learn, as well as examples, boxed articles, and case studies to help illustrate the chapter concepts. This book helps teach readers how to perform a 14-point physical examination and a 3-point swing mechanics analysis, and includes correction protocols for any failed examination findings. The text also includes practical training technology from the PGA, LPGA, and Champions Tour for golf fitness and conditioning for "well patients" looking to improve their game. Most golf related injuries are caused by lack of golf-specific flexibility combined with unstable posture. There are 14 areas of the body that must be conditioned to prevent injury and play better golf. 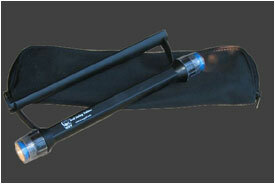 The Swing Light Trainer is a lightweight swing training device that allows golfers to see and understand their golf swing plane as they swing their own clubs. No attachment required, just use this tool with your own club and you're ready to practice. 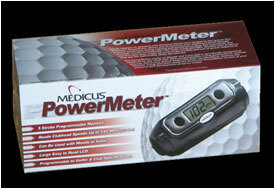 Power Meter is a golf power meter that attaches to any club in your bag to instantly and accurately read your club head speed so that you can increase your swing power and swing speed. Get instant feedback while improving consistency and control so that you hit longer and straighter!